A typical Facebook newsfeed moves at such a furious pace that it can be impossible to find that funny video you watched just two days ago. But, if you ever want to watch a Facebook video at your own pace, here are ten cool ways for downloading them. Open the Facebook video in its own tab and copy the address URL into the box. Hit “Download” and a “Download video file” link will appear. Click it to download the video with its original name or right-click it and “Save Link As…” to rename the file. The process is painless and the download is extremely fast, almost instantaneous for smaller videos. 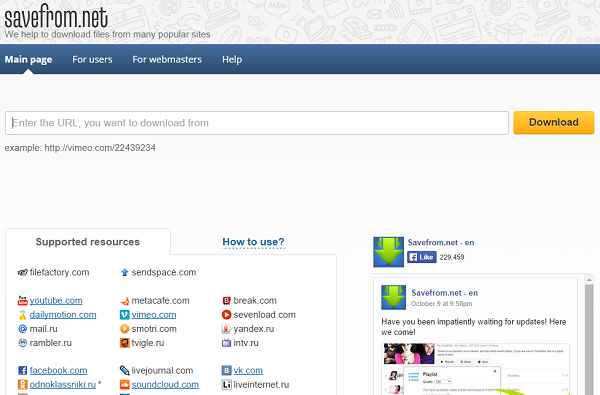 SaveVideo.me supports 32 other video sites, such as Vimeo, Dailymotion and Vine. 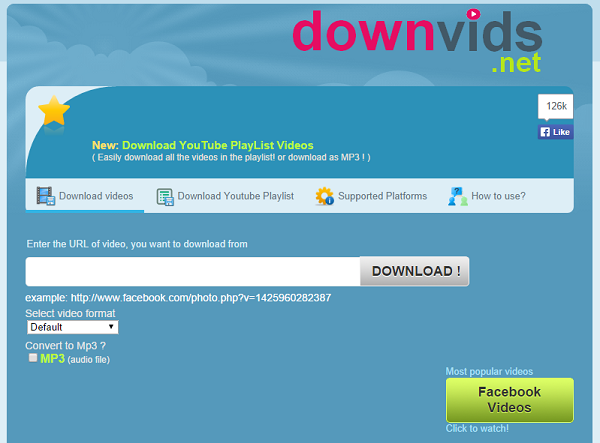 Paste the Facebook video URL into the DownVids box and click “Download”. The dropdown menu below the box lets you choose between 4 different resolutions, up to 1080p. Note that you can’t actually get a 1080p if the original video isn’t available in such resolution. The nearby checkbox allows you to convert any video to MP3 on the spot. The website is easy to use, fun and straightforward. DownVids.net supports many other sites and can even grab entire Youtube playlists and turn them into MP3. Copy the Facebook video location and enter it into the box provided on the website. Click “Download” and the available options will appear below. Right-click the file format and resolution and select “Save Link As…” to save the video to your hard disk. This website supports SoundCloud and many other sites. There is also a stand-alone SaveFrom.net Helper program that integrates into the browser and puts its button below the video so you can have the download done by the time you finish watching it. 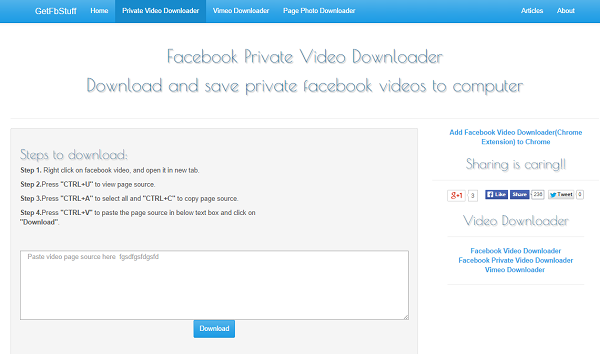 Wish to download private Facebook video from your friends? Try GetFbStuff. 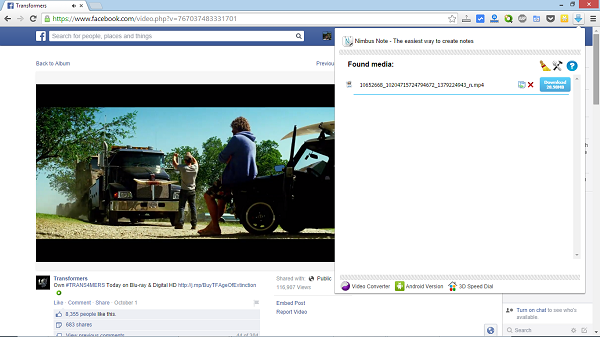 First, open the Facebook video in a new tab, but this isn’t always possible with the right-click context menu. The more reliable method is to click on the video name or the word “video” in the Facebook post, whichever is hyperlinked. Once you’re on the video page, open the page source, copy-paste it in the box and click the blue “Download” button. This method also grabs Facebook videos marked as private. The website works impeccably and the saved video is of superb quality. 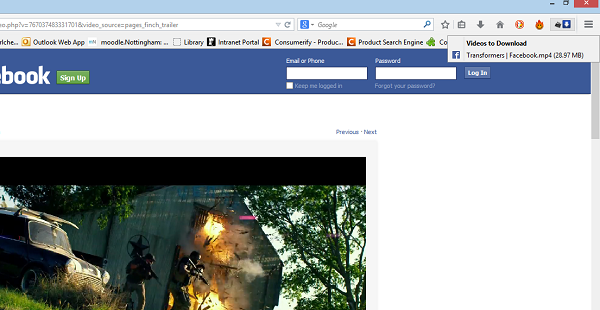 Of course, you can also download public Facebook videos at their home page by pasting the video link. This extension appears as a blue arrow next to the omnibar. Clicking this arrow will show all available resolutions and sizes and a download button next to each. However, due to Chrome Web Store’s policy, this extension does not work on Youtube. FVD Downloader supports thousands of websites but requires that you also install a related extension FDV Suggestions, which shows related offers. However, these offers are turned off by default and only appear if you explicitly activate them in FDV Downloader’s options. This add-on functions and even looks similarly to the FVD Downloader for Chrome. Clicking on the blue arrow will show everything that can be downloaded from the active tab, listing resolutions, formats and file sizes. It works everywhere, including Youtube. Grabbing videos directly off of Facebook newsfeed is possible, but the add-on does not give them separate filenames, so it’s recommended that you open the video in a separate tab. When you sign in to Facebook through this app, you can filter videos in several ways: your videos, your friends’ videos, videos where you are tagged and so on. To download a video, you will first have to share it to your timeline. There is also a gallery of funny videos accessible through this app that you can download to your phone. This app combs through your newsfeed for all videos and displays their title, uploader and timestamp. 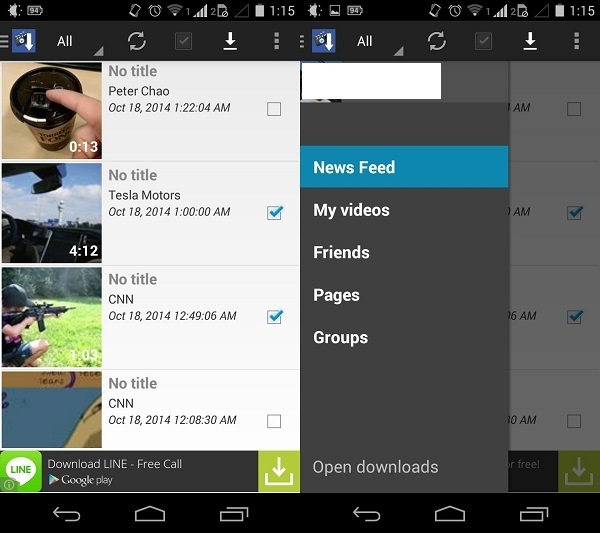 Tap the checkboxes of those videos you want to download or tap “Select all” for mass download. Note that if the owner has disabled app access to the videos, they won’t show up in this app, even if they are yours. 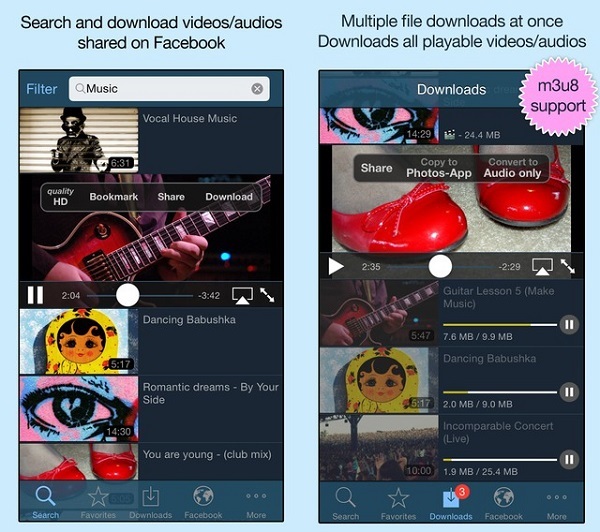 A download manager optimized for use on Facebook, VideoGet can do mass downloads with one tap, conversion to MP3 and search through playable content on Facebook. VideoGet allows for bookmarking or sharing of the content, which makes it function as a social networking app as well. VideoGet is technically impressive and can also capture stream formats, such as M3U8 and produce replayable files on your device. Highly recommended for all iOS users. Though the installer of Freemake comes with bundleware installations which you should decline, it is well worth the effort. Pasting a video link will give you a window where you can see full specifications of the video, including its bitrate. Downloading is quick and easy but converting the video to other formats, such as 3gp or mkv will require an additional download of the converter program. Options allow you to even cap the download speed or designate a proxy. 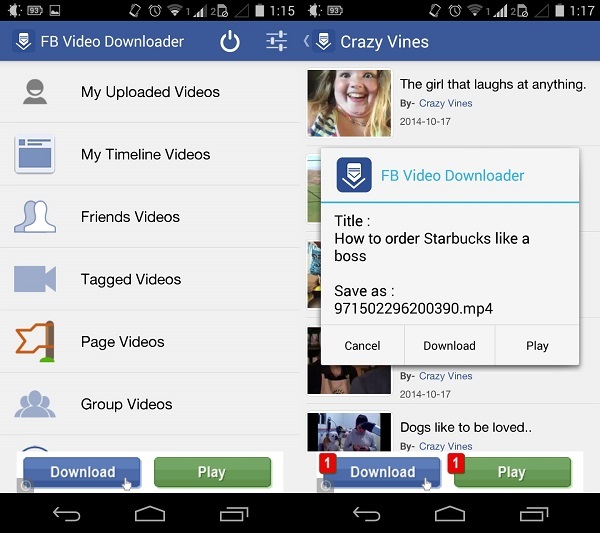 Freemake Video Downloader will ask for your Facebook login data to be able to access videos. Good to know these facebook video download tools and thanks for the sharing. I always use acethinker video downloader to save facebook videos to my laptop for backup, works quite well. It is a free cloud based software to download videos without install any software in your device. Share it here as an alternative.